4 x 10 Plastic Pop Up Register - White Discounts Apply ! Redirect air flow easily with these great pop up style floor registers. Plastic floor registers can lay flat or be directed to vent outwards. Redirect air flow away from windows and divert it back into the room. 4 x 10 plastic floor registers can also be wall mounted. When you redirect air flow you increase your level of comfort and typically save on energy bills. Plastic floor registers are rustproof and made of high impact polystyrene construction. ***Hint: The industry standard is to order using the actual floor hole size and not the faceplate cover size. Plastic floor registers will fit a 4 x 10 inch hole opening. These sturdy plastic floor registers are available in a 4 x 12 size also. 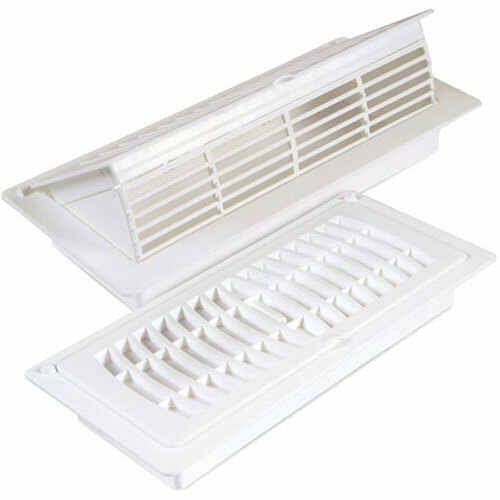 If you're looking to redirect air flow from some of your vents, these are a great affordable option. Place an order today!